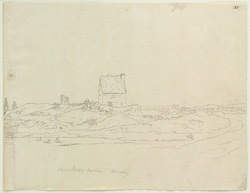 An outline view in ink of "Henslok's House". The identity of Henslok is unknown. His - or her - thatched house appears to be rather isolated. To the left of the house there stands the remains of a tower or some other similar structure.